Manchester Evening News videoTommie Rose is making a lot of money. An entrepreneurial schoolboy has managed to make £14,000 to pay for his university fees by selling sweets in the playground, the Manchester Evening News reports. 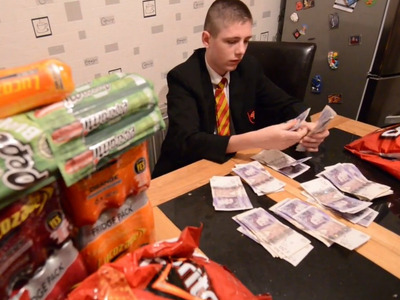 Tommie Rose, 15, amassed the fortune by selling chocolate, crisps, and fizzy drinks to fellow students at his secondary school in Manchester. He even employed two of his friends and paid them £5.50 a day. Unfortunately, it looks like Rose’s business days may be over, as teachers at his school says he faces suspension if he continues smuggling goods into school. Rose began his enterprise after being inspired by the BBC television show Dragon’s Den. Amazingly, the teenager was suspended from doing the same thing at a previous school in 2011. Rose told the Manchester newspaper that he hopes to study business at Oxford or Cambridge University, using his daily earnings, said to be around £60-70 a day, to pay for fees.